Heat oven to 400°F. Beat butter and sugar in large bowl with electric mixer on medium speed, or mix with spoon. Stir in flour, salt, egg, almond extract and a few drops of food color. It’s best to use a recipe that’s been well-tested for cookie presses. The dough, which is quite buttery, needs to be soft and just the right consistency to easily press through the design plates. Avoid adding ingredients like nuts or dried fruits. No need to grease the baking sheet as the buttery cookies should easily release from the pan, but for faster clean up you can use a silicone baking mat to line the pan. Because spritz cookies don’t spread a lot you can press them out more closely (about 1-1/2 inches apart) on the baking sheet. Using a press can take some practice, but just hold the press flat on the baking sheet without tilting it. Use consistent, even pressure to push the dough onto the pan—don’t overload each cookie. Hand-wash your cookie press, using a small bottle brush to be sure you’ve cleaned all the nooks and crannies. Allow all the parts to dry completely before storing them away. Holiday Spritz: Substitute rum extract for the almond extract or vanilla; tint dough with appropriate food colors. After baking, glaze cooled cookies with Butter-Rum Glaze: Melt 1/4 cup butter or margarine over low heat; remove from heat. Stir in 1 cup powdered sugar and 1 teaspoon rum extract. Stir in 1 to 2 tablespoons hot water until glaze is spreadable. Tint glaze with food color to match cookies if desired. In Germany, these cookies are known as Spritzgebäck. Since the German verb “spritzen” means “to squirt,” their name for this cookie press recipe has been shortened to simply Spritz, one short little word that holds a whole lot of delicious tastes and memories. 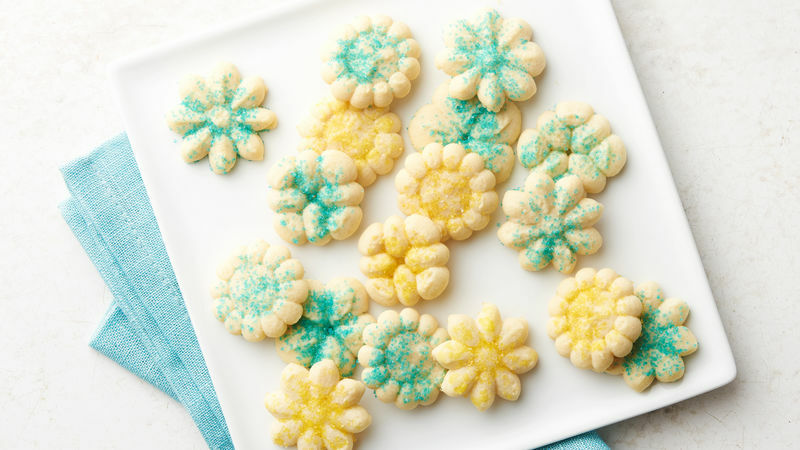 This spritz cookie recipe is a classic, but there are many creative variations served up in Betty’s best spritz cookies collection. Try snickerdoodle, egg nog or chocolate variations. While it’s possible to extrude the dough with a parchment bag, you’ll probably find that a cookie press is an inexpensive kitchen tool that makes the process of cookie formation much easier. There are electric or manual models, most requiring turning a handle, pressing a plunger or touching a button to press out the chilled cookie dough. Once you’ve purchased it, don’t just use that cookie press only once a year. It can be called into action for all sorts of kitchen chores, from icing cupcakes to filling deviled eggs or cream puffs.